The prime scenic attraction of the area has to be the stunning Dandenong Ranges National Park. Nestled in the picturesque suburbs of the Dandenong Ranges in Melbourne, this National Park is 39km east of the Melbourne CBD. 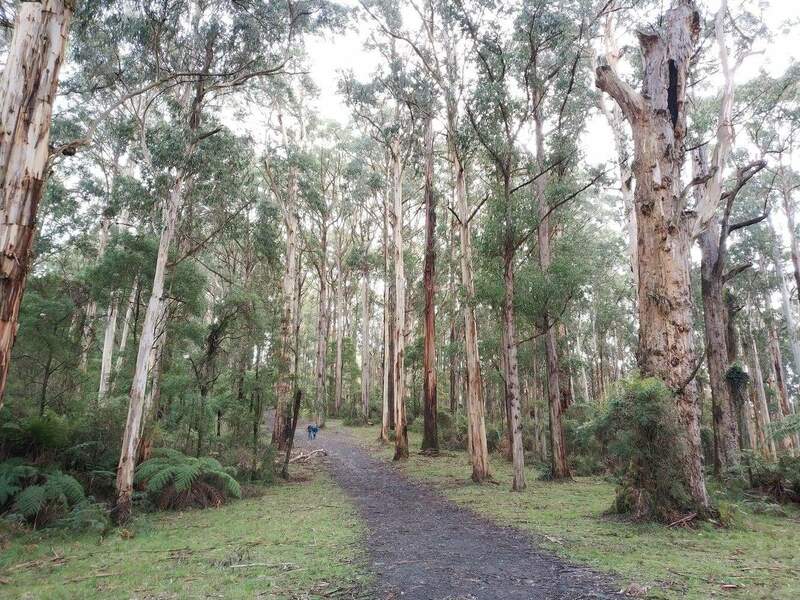 The Dandenong Ranges National Park boasts five main sections; Doongalla Forest, Ferntree Gully, Sherbrooke Forest, Olinda Forest and Mt Evelyn Forest. With the Doongalla Forest containing the majestic Mount Dandenong and Sky High lookout, this park is one of the most scenic and major attractions within the region. From the lookout, visitors can view the panoramic landscape of the surrounding area, including the Melbourne’s eastern regions. 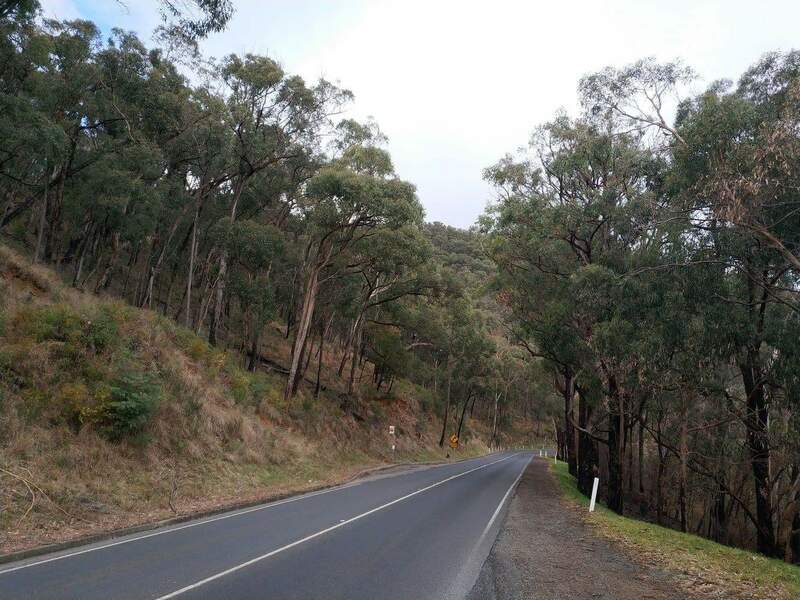 Ferntree Gully is located in the south-western region of the Dandenong Ranges National Park, housing the popular 1000 steps trail that leads up to One Tree Hill, an amazing picturesque destination. This trail is very steep and challenging and is a renowned tourist spot and a popular weekend activity for fitness enthusiasts. The national park also boasts a number of picnic grounds and scenic spots for visitors to visit. 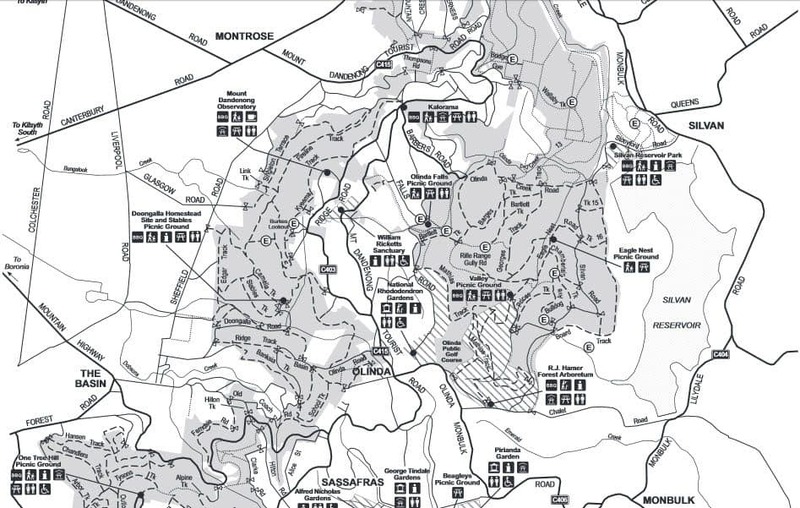 There are a number of picturesque walks and hiking trails, and you can pick up a map from the Parks Victoria website. 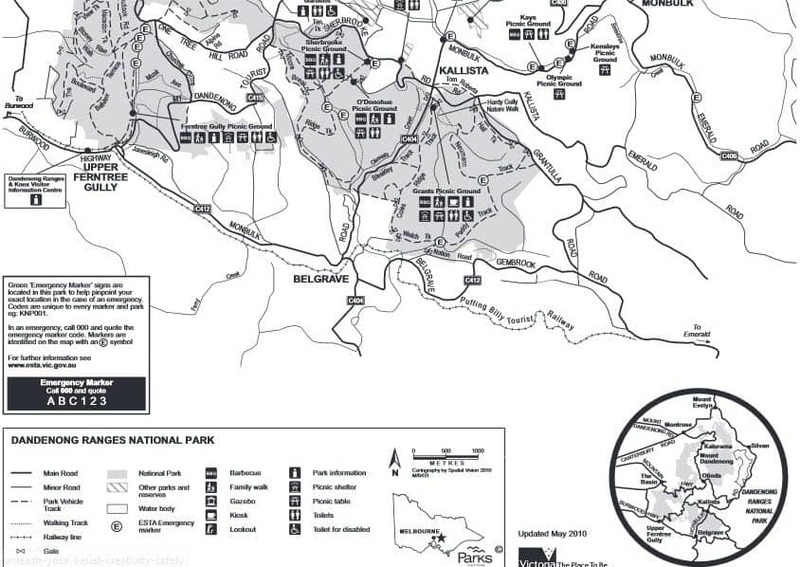 There is no fixed address for the Dandenong Ranges National Park, as there are a number of access points, so you should consult a map before entering to decide which areas of the Park to explore. Because this is a National Park with native wildlife, dogs and other pets are not permitted within the Park. 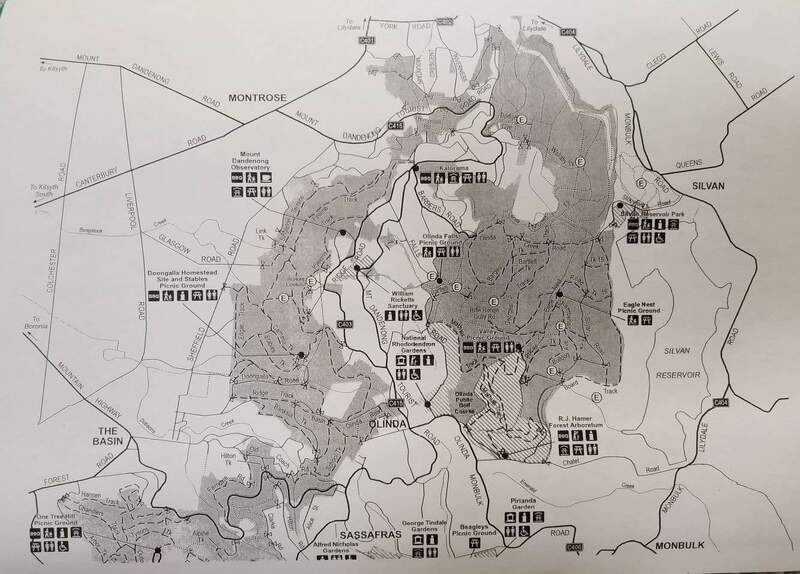 As the National Parks border on many residential suburbs, a number of native species were affected by domestic animals. Since a cat-curfew was brought in, the park has shown a rapid rise in the population of various native birds and lyrebird species. Please give me some pieces of advise on traveling to Dandenong Ranges in July, which places are suitable to see? As July is winter, is it too cold to walk around? Thank you. The Dandenong Ranges will be cold and wet during July, but it is still a lovely place to visit as many of the gardens are green and lush at this time. I would recommend the National Rhododendron Gardens, Puffing Billy, Sky High and Olinda Falls. 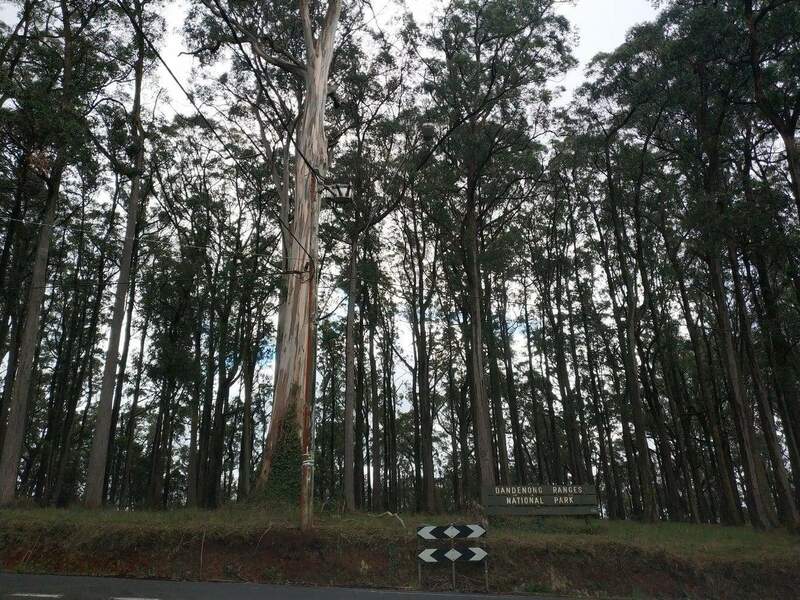 Have a wonderful time on your trip to the Dandenong Ranges! Hello. Are charcoal bbqs allowed in the picnic parks around Sherbrooke? Not sure, best to contact Parks Victoria directly on 131 963. I know that there are electric BBQs already on site at Sherbrooke, so not sure if you are permitted to bring charcoal. I haven’t been able to find any published prohibition, so best to check with the authorities. Yes, you can get to the Dandenong Ranges from the Melbourne CBD using public transport. If you are coming from the city, catch a train from Flinders Street Station which is heading out on the “Belgrave” Line. If you are heading to the 1000 steps, the best station to get off at is “Upper Ferntree Gully” station. From there it is just a 800m walk east along Burwood Highway to reach the southern end of the carpark of the 1000 Steps – around 500m extra to get up to the cafe and the start of the steps. This train trip will take you approximately 50 minutes. If you want to get to Puffing Billy, then catch the same Belgrave train but get of at “Belgrave” station (the end of the line). Puffing Billy is only then a short 250 metre walk away. This trip will take you approximately 1 hour. I hope you enjoy your time in the Dandenong Ranges! Hi Ferdinand, thanks for your question. There are a couple of options, depending on whether you want to end up north or south of the National Park. 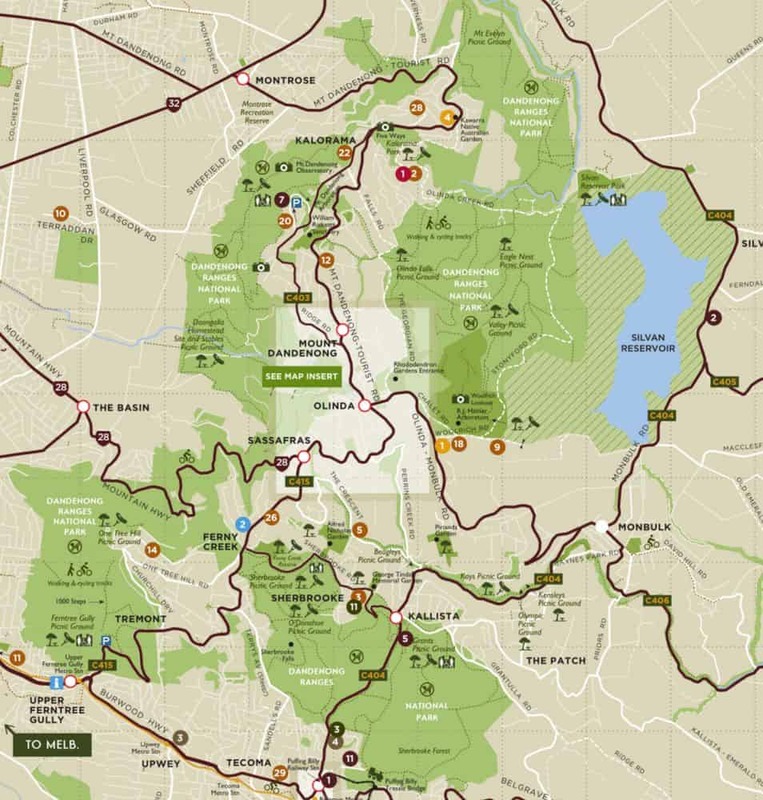 Travel by train from Southern Cross to either Lilydale (North of the national park) or Belgrave (South of the national park; near Puffing Billy, National Rhododendron Gardens, RJ Hamer Aboretum). From either station, various bus companies run services between towns and villages in the region. Get detailed information via the Journey Planner tool on the Public Transport Victoria site here. To get to Doongalla Forest, take the Lilydale line from Southern Cross, get off at Croydon Train Station. Catch the 688 Upper Ferntree Gully Bus and get off at Cambridge Road. Walk about 1.5kms to the Doongalla picnic ground. 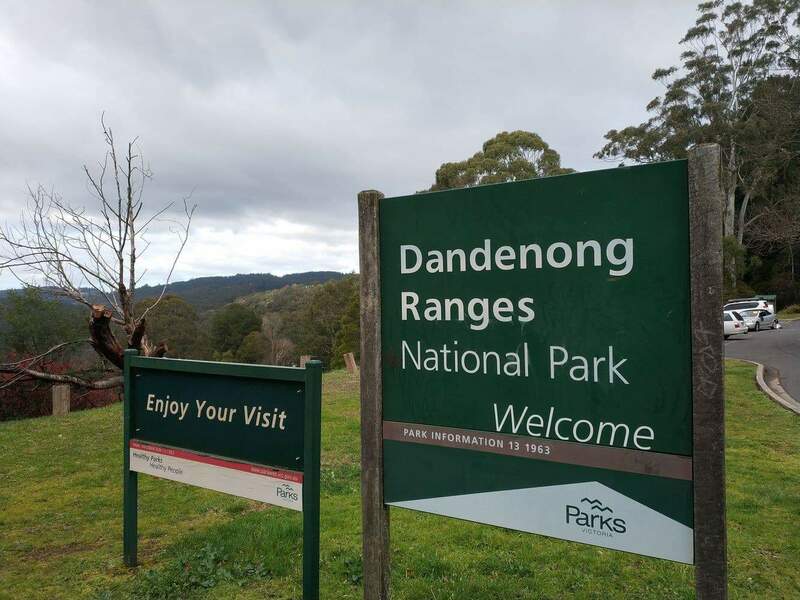 Enjoy your time in the Dandenong Ranges National Park! Where can I see and feed birds in the Dandenong Ranges? Head to Grants Picnic Ground to feed birds (70 Monbulk Road, Kalista – Melway 75 K4). Grants Picnic Ground sits within the Sherbrooke Forest, the largest section of Dandenong Ranges National Park. Enjoy your day in the Dandenong Ranges! Can we take wedding photos here? Are you able to confirm with us if two limousines can drive through to the national park? The Dandenong Ranges is a great spot for wedding photos. Limousines will certainly be able to navigate the roads as they are well maintained and many tour buses also drive through these areas. A great spot for photos is the Alfred Nicholas Gardens which is open 10am to 5pm every day, but note that to take wedding photos you will require a permit. I have attached some information about the park – http://parkweb.vic.gov.au/__data/assets/pdf_file/0020/313157/05_0674.pdf. Contact Parks Victoria on 131 963 for more details. 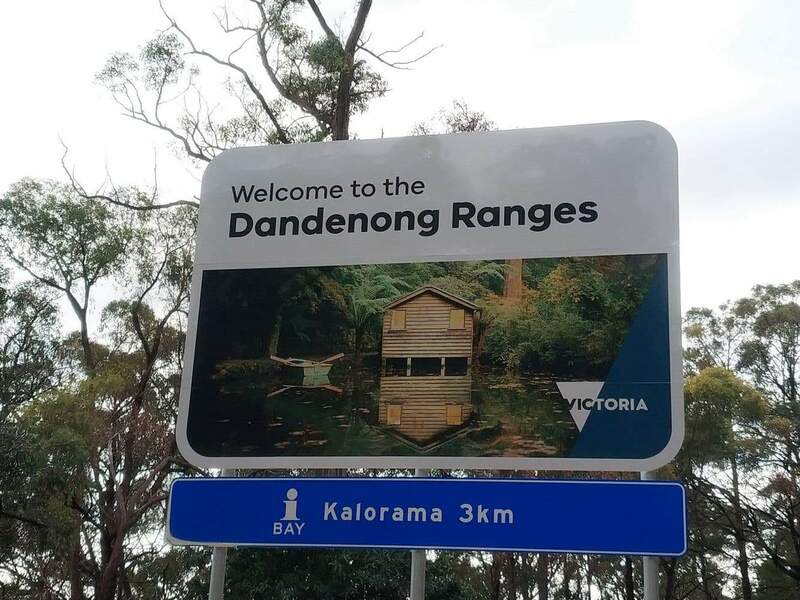 Hi, I would like to enquire whether the Dandenong Ranges are accessible via public transport from the central area in Melbourne. What is the approx travelling time?